Greenville High School’s Auto Tech Advisory Council devoted much of Tuesday’s meeting to discussing compensation for students working in co-ops. GREENVILLE – The pay scale for students working co-ops and how to incentivize students to pursue careers in automotive technology dominated the conversation during Greenville High School’s first Auto Tech Advisory Council meeting of the 2018-19 school year. 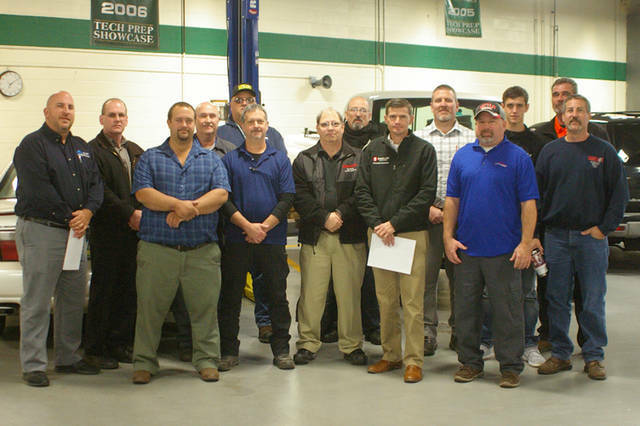 Greenville’s Auto Tech Advisory Council – comprised of Greenville High School staff, Sinclair Community College automotive technology staff, local mechanics and a GHS student – met Tuesday morning to provide guidance for the school’s auto tech program. The council is crucial to the success of the program, said instructor Travis Nicholas, who led Tuesday’s meeting with fellow instructor Matt Obringer. Greenville’s auto technology program is open to high school juniors and seniors. Along with teaching students in the classroom, the program helps connect dealerships and other mechanic shops with students who can learn through on-the-job experience. Seniors who prove themselves as being worthy have the opportunity to co-op, spending part of the school day working and earning money. Members of the council expressed concerns about the pay scale for those student employees and how to best motivate them. A lot of students today think they shouldn’t have to start at the bottom – both financially and in job responsibilities, council members said. One business owner conveyed a story of firing a student who wasn’t happy with his first paycheck, Nicholas talked about a student who took a factory job where he was given more money only to find he didn’t enjoy that job, and council members expressed concerns about losing students to jobs at fast-food restaurants where thy possibly could work more hours and earn more money. While wanting to satisfy the needs of student employees, business owners said extra money already is spent on training them and fixing their mistakes. Plus, some council members said education is part of the value of co-ops and at least the students are making some money instead of making nothing in the classroom. Director of Career Technology & Special Education Andrea Townsend said businesses could offer incremental pay raises to appeal to students, comparing them to leveling up in a video game. Council members also suggested giving away tools as rewards, which add value and could incentivize students to remain in the automotive field. Greenville High School Principal Stan Hughes said even consistent and frequent feedback, which requires no monetary commitment, could appeal to today’s youth. The council didn’t want to set standard rules for pay raises or other incentives, recognizing each business has its own operating methods, but agreed clearly defined expectations and timelines for pay raises could be strong motivators for students. For the dealerships and mechanic shops, finding ways to attract and retain employees is a concern as more and more Americans near the retirement age. “Like one of the guys talked earlier, the Baby Boomer era, you know, they’re getting ready to retire so every field in America is going to be just busting over so there’s going to be a big need not just in automotive technology but everywhere,” Nicholas said. Nicholas is encouraged by the level of interest Greenville is seeing in automotive technology as the foundation classes for freshmen and sophomores have increased in popularity the past couple years. Ultimately, the Advisory Council’s goal is to develop passions and prepare students for careers in the automotive field. This entry was tagged Auto Tech Advisory Council, Greenville, Greenville High School. Bookmark the permalink.